ROCK ON!!! Own a piece of the mountain! GREAT location on Beech Mountain, North Carolina! FURNISHED! TURN KEY! Just in time to beat the heat! 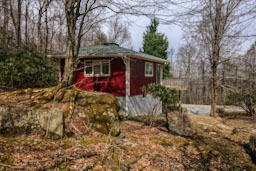 Adorable mountain ski-chalet on a PAVED ROAD, near Beech Mountain Skiing. Large romantic tub downstairs in the "ROCK ROOM." Check out the Doll-House Tour on the movie real tab! Sleeps 6-8.